More evidence to that point surfaced Tuesday when Arby's announced the launch of a swag subscription box called Arby's of the Month. It's a monthly delivery of seasonal goods (no actual food) to your doorstep. The first box was unveiled in the announcement. 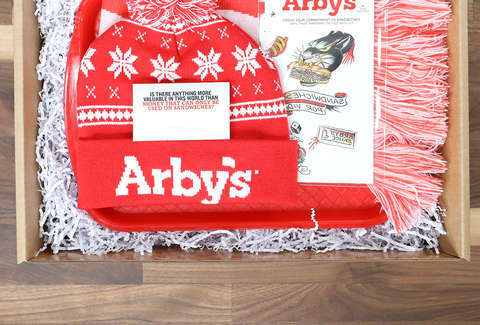 It contains an old school Arby's serving tray, toque, bacon scarf, and some temporary tattoos that look a lot like the options from that time Arby's gave out real Arby's tattoos for free. If this sounds appealing, we've got bad news. The subscription boxes completely sold out in under an hour. People went crazy for them, which was probably aided by the fact that a six-month subscription only cost $25. The company announced the service via Twitter, and the replies were a strange mixture of elation and extreme disappointment. Me: "Why would I ever buy anything with a brand's logo on it like it's an episode on black mirror, that's ridiculous"
Also me: "I'm sure this will be interesting and may be even fun"
I may have just purchased the dumbest or best thing I have ever purchased? Idk what this is but I bought it. The meat mountain boxes may be out of stock, but you can sign up on the Arby's of the Month website to be notified when they're taking more subscribers.